The Mariners, A’s, and Nationals pulled off a three-way trade, one that likely improves just one of the three teams this year, and potentially makes one team worse, both now and in the future. 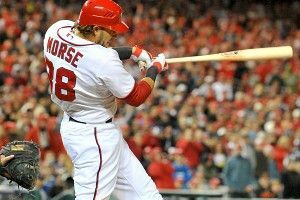 Seattle dealt catcher John Jaso, acquiring first baseman/corner outfielder/DH Michael Morse from the Nats. Oakland picked up Jaso, sending pitching prospects A.J. Cole and Blake Treinen, along with a player to be named later, to Washington. The Mariners nominally get top billing in the trade, since the 30-year-old Morse is the most famous player of the five. In 2011, Morse hit a stellar .303/.360/.550, smacking 31 homers. Injuries cost him 60 games in 2012, but he still whacked 18 home runs, albeit with a diminished line of .291/.321/.470. Despite his good-to-very-good power, Morse is a fairly limited player, because he has few other tangible skills. His career walk rate of 5.9 percent means he’s heavily reliant on batting average to prop up his on-base output, something that failed to materialize last season, when his walk, strikeout, and ground-ball rates all went in the wrong direction. Morse is one of the slowest and least effective base runners in the league and is a terrible outfielder who probably belongs in full-time DH duty, even though he’s said he has no interest in filling that role. His 2011 output of 146 games played was a career high, and durability is a concern. If everything breaks perfectly for the Mariners, Morse would give them one year of slightly above-average production, plus four singalong opportunities per game for fans at Safeco Field, before hitting free agency. Dan Szymborski’s ZiPS projection system is less optimistic, forecasting a line of .253/.306/.415 with a 103 OPS+ and declaring Safeco a lousy match for Morse’s skills (though the walls are being moved in a bit for 2013). The other issue for Seattle is one of fit. The M’s are now carrying the following players as candidates to fill the first base/DH/left field jobs: Morse, Kendrys Morales, Raul Ibanez, Justin Smoak, Jason Bay, Casper Wells, Mike Carp, and Eric Thames. They might not believe in half of these players, particularly one-time top prospect Smoak. But they’re also probably underrating players like Wells. Depth isn’t necessarily a problem, of course, but it can be if you’re stripping another position bare to make it happen. By jettisoning Jaso, the Mariners are down to the defensively terrifying Jesus Montero and pretty much nothing else behind the plate, with top catching prospect Mike Zunino likely at least a year away from challenging for the number-one role. From Seattle’s perspective, this reads as the latest reaction to a huge dearth of power from the traditional power spots last year, as well as overvaluing power skills compared to on-base skills. You also get a whiff of urgency from M’s GM Jack Zduriencik, who’s entering his fifth year as Mariners GM with little to show for it and may well be under heavy pressure to produce results this year in an AL West division that features three very strong rivals. What makes the deal even weirder for the M’s is that they may well have downgraded their offense this year, while also giving up an additional two years of service time with Jaso. The 29-year-old lefty-swinging catcher has plenty of holes in his game. He’s another subpar defender behind the plate, and has no pop at all against lefty pitchers. But he’s also coming off a season in which he hit .276/.394/.456, a robust line in a park as brutal as Safeco played last season. Jaso’s value looks even stronger if he can be platooned and thus shielded from lefties: He hit .302/.419/.508 against right-handed pitching last season. For some context, Joe Mauer hit .336/.428/.490 against righties in 2012. Maybe you start to wonder why Jaso would be dealt twice in the past two winters, the previous time for a relief pitcher who was once charged with sexual assault. But for the A’s, it’s also hard to see how Jaso won’t be a sizable upgrade over George Kottaras as the lefty-swinging portion of a timeshare with second-year man Derek Norris at catcher. ZiPS has Jaso hitting .259/.361/.398 with a 110 OPS+ in Oakland; given the A’s ability to understand and leverage situations such as platoons, don’t be surprised if Jaso, spared from facing many lefties, beats that mark. Oakland might even get a little lucre for Kottaras, whom they designated for assignment following the trade. The Dodgers, Yankees, and Rays would all seem like logical candidates to acquire a part-time, lefty-swinging catcher with a bit of pop and patience. The A’s were sitting on a ton of young pitching after trading Trevor Cahill and Gio Gonzalez last offseason for a passel of prospects, and they cashed at least a couple of those arms in this trade. Cole is the more recognizable name, having come to Oakland as part of the Gonzalez deal. A 21-year-old right-hander who was rated Baseball America’s number-57 prospect a year ago, Cole got promoted to Stockton of the hitter-friendly California League in 2012, and got rocked there, giving up 40 runs and 60 hits in 38 innings. Returned to Single-A, he pitched much better, posting a 102-to-19 strikeout-to-walk rate and a 2.07 ERA in 95&#8532 innings at Burlington of the Midwest League. The Nationals had whittled down their minor league pitching depth in acquiring Gonzalez. By landing Cole and Treinen, they’ve rebuilt some of that depth, while also dumping Morse’s $7 million salary. ZiPS even thinks Cole could be an adequate fifth starter in D.C. this year should something go awry with the Nats’ loaded rotation, projecting Cole for 114⅓ innings pitched, a 4.49 ERA, and an 89 ERA+. Still, while the Nationals might end up with the best long-term return, it’s also curious to see a team positioned as a World Series contender make a trade that offers no obvious source of help for the coming season — other than perhaps freeing payroll room for a trade deadline move or two, should needs arise.